Coco – Pixar’s first non-sequel film since 2015’s The Good Dinosaur – delivers heartwarming storytelling and eye-catching visuals, all the while honouring the power of family and music. It’s set during Dia de Los Muertos – the Mexican holiday Day of the Dead – and tells of Miguel (Anthony Gonzalez), a 12-year-old boy who, despite his family’s decades-old ban on music, aspires to be a musician like his idol Ernesto de la Cruz (Benjamin Bratt). His desperation to prove himself leads him to his Cruz’s tomb in search of an instrument, where he’s suddenly transported to the Land of the Dead. Here, Miguel reunites with an array of deceased family members, at least one of whom he must obtain permission from in order to return home and live out his dreams before sunrise. 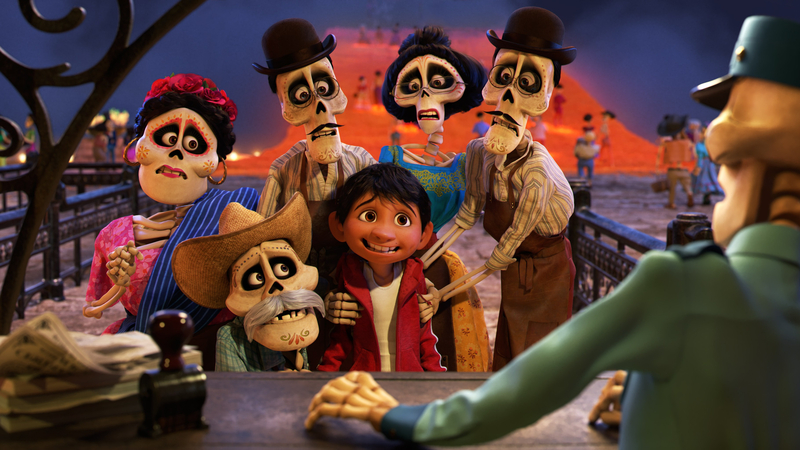 Lee Unkrich, who last directed Toy Story 3, explores similar themes here (maturation, acceptance, to name but two), yet Coco has plenty of individuality to set itself apart as something fresh. The music, for one, is an integral part. It’s a crux at first, something that carries bad memories and pain for the whole family. But as the film moves forward and Miguel’s flair for chords and singing pours out from within him, it takes on a new form – one that’s positively inspiring. The songs are beautiful; the lyrics closely tied to the narrative in a way that awards the film an extra depth and a sense of history that doesn’t have to be spelt out. Remember Me deserves a special mention, its repeated use in key scenes likely to invoke tears. The narrative also nicely explores Miguel’s coming-of-age and ties to family, both new and old. Through his own desires for personal exposure, he’s able to reflect and discover a whole new meaning of what it means to be a part of his rich culture. His heritage is something to be cherished, not pushed aside like it has been by his parents and his parents’ parents up until now. Matthew Aldrich’s script is rich with detail. Like most Pixar films, it offers something for everyone, universal even though it taps into the Mexican way of life so vividly. Miguel’s exuberance is captured well by Gonzalez’s voice work, who’s also able to tap into the kids’ want for parental acceptable, whatever path they choose. It has a slow build up that could’ve done with some tweaking, but once it hits its strike, it makes a real impression. This is also achieved through the animation, which is breathtaking. The Land of the Dead, in particular, is ravishing to look at. Even the smallest of details, such as the way the deceased are scanned in and out of the afterlife, is incredible. Unkrich, co-director Adrian Molina, and the skilled team next to him paint a realistic picture that transcends the cartoon label some place on animation films. Pixar, once more, prove themselves to be at the top of the film tree, delivering another hit that’s chock full of heart, humour and visuals rooted in realism.